Prominent & Leading Exporter from New Delhi, we offer buffalo topside meat and silverside meat. 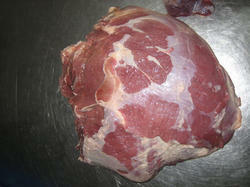 We are one of the leading exporters of Buffalo Topside Meat. Our company has been involved in the production of Silverside Meat offered at the most affordable rates. This buffalo meat is highly demanded in market because it is rich in protein & provided by us at reasonable rates. We store this meat at proper storage systems with the help of our experts. It is rich in taste & High nutrition value are some quality of this meat & very much preferred by a lot of our customers.